Investing in commercial security cameras for your building can be expensive. It may even be tempting to buy the best security cameras and choose a lower quality commercial security camera installer. But if your security cameras are not installed properly, it won’t matter how high-quality they are—they just won’t work properly. There are several factors to consider when installing security cameras. This includes placement, weather factors, and how to connect your specific system. Connecting an analog security system is very different from connecting the wireless systems more commonly used today. Let’s take a look at the factors that make using a great commercial security camera installer so important. Not all security cameras are made equal. If you are placing cameras on the external edges of your building, consider the ruggedness of each camera. Is it waterproof? Susceptible to wind damage? Will the footage still be good quality even in the rain? A good commercial security camera installer will have worked with most high-quality cameras before and have the experience to tell how much shelter each one needs in order to operate properly. Commercial security cameras that are easily reachable are at a much higher risk for vandalism. A great commercial security camera isn’t cheap, and you don’t want to have to constantly replace them due to neighborhood vandals. Cameras that are easily reached also present a security weakness. It’s much easier to disable a camera that you can reach with a footstool than to disable one that you need a firetruck to get to. Obstructions near your camera can block the footage and create blind spots that make it easy for a burglar to get around the camera undetected. And don’t forget, environmental obstructions can change seasonally or even daily. For example, nearby trees grow taller by the year with longer branches that can cover the view of your footage. A particularly good windstorm can blow branches that can hit your camera if they’re within range. A great commercial security camera installer will be able to evaluate any nearby obstructions and install the camera accordingly. Light sources can also be an environmental obstruction. When installing a security camera, it’s important to consider exactly where the sun will hit the camera at all points during the day. If the camera faces the light directly, it will decrease the quality of footage that you receive. However, having a light source directly behind the camera means clearer footage. When installing a security camera, it’s important to consider the cabling involved. If cables are out in the open, they’re more easily cut by vandals and susceptible to weather damage. A great commercial security camera installer will be able to hide the cabling by installing cameras on the side of buildings or ceilings to conceal the cables. If you recently had your cameras installed and notice the cables are still visible, it not only creates a security concern, but also can decrease the professional aesthetic of your building. While you don’t want your security cameras within reach of vandals, easily visible cameras can deter potential intruders. When installed properly, your cameras should be prominent on the outside and inside of your buildings. The last thing you want is for your building to appear as if it’s an easy target for burglars or other criminals. There are several different types of security camera wiring systems. 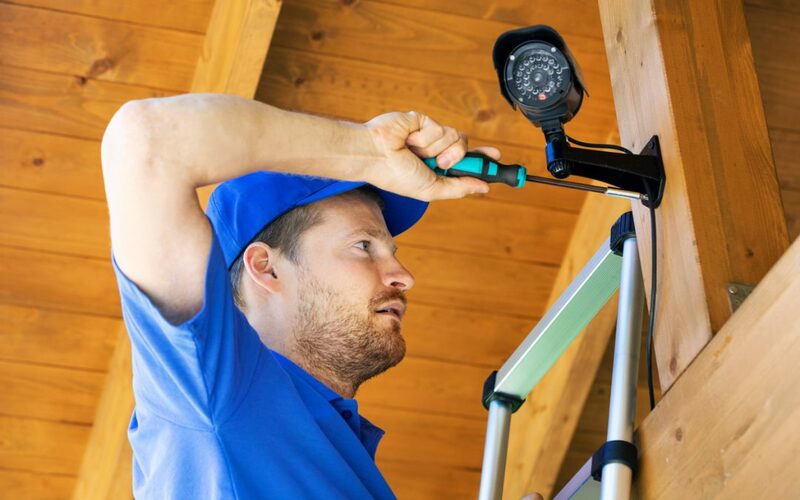 The best commercial security camera installer for you and your business will have prior experience installing the type of camera you’d like to use and be up-to-date on the latest training. An analog security system is connected with one cable that supports video and provides power to your camera. Installing an analog system properly means bringing cabling through walls to connect both a DVR, power source, and the camera system. A power-over-the-ethernet system requires an ethernet cable that connects the camera, the recorder, and a router for the internet. Because of the cabling, this type of security camera will also require cabling to be set up in the walls or ceiling of your building and pulled through to the next connection. Wireless security cameras do not require cabling but do require extensive knowledge of IT networking and wireless connectivity. These cameras use a DVR and a small wireless transmitter in order to record footage. The camera will need to be connected to a power outlet. Each security system has its own intricate design and needs a skilled hand to install. A loose cable could mean low quality footage while a poorly set up wireless transmitter means your footage isn’t recorded at all. The ultimate risk of using a low quality commercial security camera installer is a facility with a weak security system. Even if you buy a high quality camera, a light obstruction or loose cable means the footage that you record could be useless in the event of a burglary. Choose the Right Commercial Security Camera Installer. Choose Medlin. Medlin Communications prides itself in system integration. This includes security cameras for buildings and businesses of all shapes and sizes. With Medlin you can rest assured that it’ll get done right the first time. If you’re looking for your next commercial security camera installer, get in touch with us online or at 1-800-4-MEDLIN.